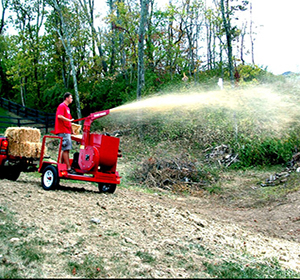 This Straw Blower is the leading compact straw blower in the landscape industry and the most widely used for industrial rentals. For the contractor, materials costs will be reduced by up to 20% over hand shaking straw. Also, labor costs will be significantly reduced because an average of 120 bales per hour can be applied with two people. The costs of the machine will be recovered quickly with labor savings and reduced jobsite time. Job Quality is Better with Even Applications of Materials, even with wet straw or heavy hay. Because beater flail chains are used instead of cutting knives, longer pieces of material are applied onto the ground improving job quality. Also with this design, clogging almost never occurs. The Fully Rotational Metal Cannon (360-Degree) eliminates wear and tear associated with hose. But, if a hose is needed to reach hard to get to areas, the user can still attach up to 100’ of 6” hose with the optional hose coupling attachment. 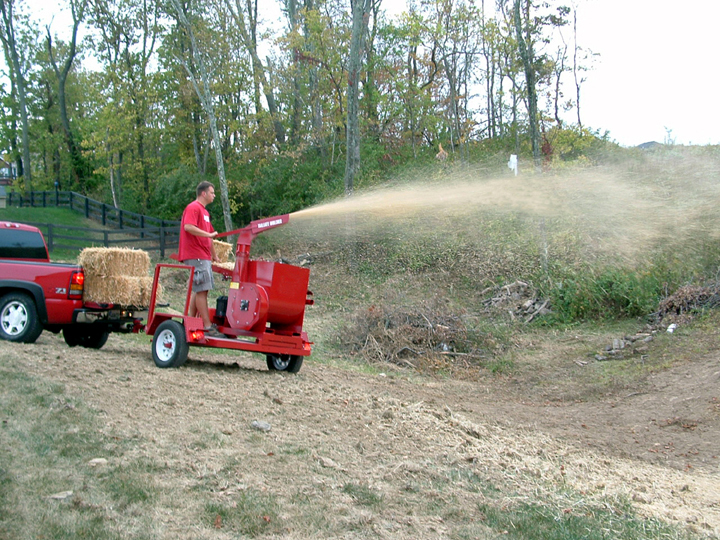 A Skid Mounted TurfMaker® Straw Blower is ideal to use on the tail gate of a pickup. The unit has fork pockets for easy handling. Trailer Mounted,the unit can be towed with a pickup, leaving more room in the bed of the truck for materials.